Bicycling to and from work and/or school is well suited to the University of Rochester’s spring, summer and fall climate. Biking is affordable and a healthy way to get around. Biking is not just for leisure anymore – a growing number of faculty, staff and students are choosing to commute by pedaling past the pump, and improving their health while saving on transportation. Click this link for a listing of our free 2019 bike safety and maintenance seminars! Please join us and bring a guest! We offer free bike racks throughout both campuses, or bicyclists can purchase a space in a Medical Center bike cage or locker. Bikes can be stored in our fully enclosed, weather-protected, padlocked bike cage located on the ground level of the hospital’s ramp garage. For a small fee, users of this swipe-access cage can also purchase a locker and shower access to URMC’s Fitness & Wellness Center, to freshen up after you arrive. Bicycles may not be parked next to sign posts, trees, light poles or handrails. Riders that would like to take their bicycles into the building with them are welcome to do so as long as the bicycle is not ridden in the hallways and is stored in a dorm room or private office. Bicycles may not be stored in hallways, break rooms and/or public places. Always lock your bike with a quality U-lock. Place the lock through the frame, front or rear wheel, and a bike rack. Be sure to remove a quick-release front wheel and secure it through the U-lock as well. Do not leave your bike unlocked. Stay aware of your surroundings. Be watchful of people at or around bicycle racks who appear to be “checking out” the bikes. A bike owner will normally walk directly to his or her own bike, whereas a thief will survey all the bikes, looking for an easy target. Call Public Safety at 275.3333 right away to report any suspicious activity you observe. Like to Take Your Wheels on the Shuttle? 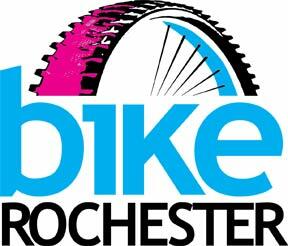 The City of Rochester is dedicated to making this a world-class bicycling community. Since the summer of 2011, 45 lane miles of on-street bicycle facilities have been installed with many more planned in the coming year. The city has also greatly expanded their off-street trails network and added a significant amount of bicycle parking around the city. Visit bikeRochester to learn more!